Good for you!!! Great! Now, store this experience away, in your little chest of memories, that you can use, for next time you are nervous. "I was nervous that other time, but-- i did pass the test." kinda thing. Might help build up your inner confidence that you CAN do it!! AWWW, that was real sweet story indeed! love how you write! "One Measly Act Of Charity"
i LOVE your writing style!! wow, what a gift there!! I could read you all day long, you should be published, YOU ARE A TALENTED WRITER!!!. I love anyone doing acts of charity, for any reason, and i love supporting transplant efforts and i love love love supporting research, too! oh, i thought it was a sidedish at the nearby takeout place... to the OP, yeah, every once in a while, i have trouble with some of the acronyms used here, as the words change from time to time, and new words are invented, too. but i have learned, we can get by with LOL, or rofl, prn, or tid or ngt or BFF or DH or a few others, but ohmidawg if you post ppl instead of people, oh my! they will throw eggs! ha ha!! well? how'd it go? did you pass? Hope you did well!!! Leslie, if i find the sublingual area dry, i'd always moisten it, or, if patent ws able, have a sip of water first, asking them to sort of whoosh it around their mouth a bit prior to swallowing the water. do you think either of those interventions would help sublinqual absorption, or, have i been following wrong advice for eons? OHhh, maybe it was just a joke. oh!! ha. all righty then! oh sure, every nurse wants to be a manager, yeah, that's right. How did you get so much knowledge about what nurses really want, in only 5 months!! wow! Yeah, the idea of being the rearend to kick if anything goes wrong, being the one to run to, if anyone is honked off about anything, yeah, being the one to squeeze in tons of 'meetings' with all kinds of boards and people, being the one to make sure everyone did this or that latest CEU or whatever, being the one to sweat out the next JCAHO exam or many other exams your unit must pass, and tons of other duties, hearing tons and tons of endless complaints and whining, every single day, trying to please both those above you, and those 'under' you, doing tons of overtime for free cuz you are salaried, staggering home at 7pm with a headache, ALL done for a measley amount more than your floor staff is making, oh yeah, huge mass appeal THERE! yes, nisteber, no doubt, your 5 months in nursing have equipped you with deep insights into why a nurse whose kids are in college would still be working...mmmHmm. yeah, that's it, they are all just inept or something. NO way anyone actually loves what they do, nope. btw, who mentored you when you arrived? and why oh why do you think it is only 'older' nurses who could be unwelcoming? or only 'younger' nurses arriving as new employees? why would anything lead you to believe that being mean ever makes anyone happy? I don't think being mean ever makes anyone happy, but, maybe that is just my own frame of reference speaking. Anytime i have ever been anything even close to mean, i felt like crap, and ran to apologize, sure did not make ME happy. But, to each his own. but, have hope, no doubt, in month#6 of your profession, you will gain even more knowledge of what is going on!! Hang in there!! Are you a nurse with "alternative" spiritual beliefs? so i thought i would, too. .....although the title of this thread does not apply to atheists, as, by definition, we have no "belief system" about gods. (alternative or otherwise) Might be why you have 6 pages of mostly pagans and wiccans, etc, replying to this thread, and very few atheists. Atheism is a belief system, the way bald is a hair color. Atheism is a belief system, the way not collecting stamps is a hobby. Atheism is a belief system the way abstinence is a sexual position. Things have vastly improved for atheists in just my lifetime, oh wow, you guys should have seen the 70s! shiver! First remark ws always "you wil burn in hell!" and First question, invariably, was "Well, do you worship the devil then?" Not that long ago, people had never heard of an atheist, we were not on tv, no one was out at all, our numbers were far far less than they are today, and no books or mags would be on the shelves, and only were mentioned negatively, always. Only atheist i ever saw for first many decades of my life, was my own reflection in the mirror, and Dr Ohare being pelted with eggs when she left her home, and mocked by the reporters and anchors with much relish. I once had "you will burn in hell" keyed into my car for being out. People could treat a person with almost horror upon finding out you were not a christian, let alone an atheist. OH, i could bore you all with tons of stories of the typical reaction: to anyone finding out you were an atheist back then. things have changed!! Now, there are well spoken atheists all over tv, all over the internet, websites dedicated just for us!! Although atheists are hard to count, some counts have us as hight as 20% of the population!! (some nations, we are the majority, like Norway, for example). it's becoming a whole different atmosphere, so glad i lived to see it. Most everyone today has met or at least heard of an atheist. They've stopped throwing eggs and keying our cars. (well, most of 'em) We've come a long way, but, have a long way to go yet. 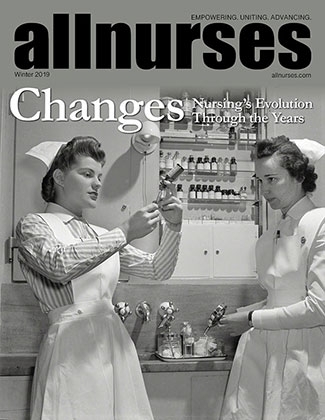 LIke many atheists, I have learned to not bring it up at work, instead, i do this: (reply #2) https://allnurses.com/nursing-and-spirituality/do-you-have-799254.html#post7046581 that^ could work for all of you with alternative belief systems, too. why would your gender be even remotely applicable to wanting to do peds? What is this "death with dignity" law you refer to? I have never heard of it. Is this an "article"? if so, i will vote for THIS one next time we are supposed to pick favorite article. OHhh, i am so so saving this article somewhere in my favorites list. Oh, thank you thank you for saying these words, GrnTea, oh it is a wonderful thing to read. This should be mandatory reading for anyone who posts "Nursing eats it's young." I have always objected to the word "young". This old worn out, not true statement, comes closer to the truth, (if/when it does happen) if we reword it to read "Nursing eats the new employee" It doesnt' matter the nurse's age. This is not "just" nursing either. Many many other high-intensity or competitve professionals experience sometimes not being warmly welcomed aboard. another point, is, many people---of any age----just do NOT easily warm up to new people, strangers, as quickly as others do. It is not the age of the nurse arriving, nor the age of the nurse welcoming new employee. Young nurses AND old nurses both can be unwelcoming, even petty and nasty or uppity. A person's character really is not locked in by one's age. I've moved extensively, from coast to coast, and was often the "new" nurse. Occasionally, i am not much welcomed, yet, i stand there with a stripe of gray hair and decades of experience, i am not young, and i am not a new grad, either, it is just i am new to them. It's not just *me*, i've witnessed this happen to other new employees, it happens sometimes, that some people just don't take to strangers right off the bat. I suspect, it might be possible that a very needy person who is insecure and/or not yet confident about nursing, might feel it even MORE, and blame that on her "age" than a nurse who knows her stuff might. still, overall, what i've seen and experienced, is, most nurses do help each other, they really do, regardless of age. I've been taught tons of stuff by other nurses, and i have tried to always help out a nurse in need. Like GrnTea says, it really is far far more common, that nurses DO help each other. Probably none of us would have made it, without other nurses teaching us and helping us. Such great posts above!! Not sure this idea would help, but, most clinics are only open Mon-Fri, with set hours, no beds in them. This is true of most clinics, like doctor offices, community health care centers, women's health care clinics, etc. But, some clinics do have beds in them, such as walk in care centers, and outpatient surgery centers. Also, IV team is kind of different type of nursing. Usually, you are not responsible/not involved for anything but the IV itself. You get to run all over the house, and see everything going on. There is much running about, on your feet all day, but, it is a different form of nursing. (can be stressful though, esp the central lines and time budgets) Special Procedures in radiology involves sedating the patient while the procedure is being done, nice work, imo, but, requires extensive experience. I've never done school nursing, and that'd involve having the right kind of experience and knowledge, but, that might become a goal for you, too. Pediatric home care, most definitely involves a bed, but *most* of the patients there, are very small. It is generally a low stress day. and i so agree with GreenTea, that cardiac rehab nursing was kinda cushy work. You mostly hook the patients to monitors, (almost always, these are outpatient people, who drove themselves there) and run strips and a few vitals while they walk on treadmills, etc. I tended to get a little bored there, just watching folks walking on treadmills and other equip, but, there are no beds in that room, and it might provide a more relaxing day for you. so sorry for your loss. Another med i have always admired for speed of relief, is sublingual morphine, Roxanol. Only a drop or two under the tongue, and the person seemed comfortable. Of course, i've never had the med myself, but, I sure did love giving that med, felt like a magic fairy when i did. No needles, no swallowing, but Very fast relief, even for people who were suffering terribly.